Welcome, developers! TaxiFareFinder offers various ways for you to integrate with our features. Please see below for the current options. Do you have a taxi or travel website? Do you want your own taxi fare calculator? Try TaxiFareFinder's embeddable calculator. You can start immediately here, and best of all, it is free! Simply take the code below, and apply it to your website's HTML. The default size is 780 for width and 700 for height. Why TFF Calculator over others? Accurate! - Uses local rates & calibrated with real fares. Accepts location names! - No need for exact addresses. Just enter the location e.g. "Downtown...", "The White House...", "Joe's Crab Shack...", "Boston, MA"
If you are a taxi company or travel agency, you may want your site visitors to have access to accurate taxi estimates. Using TaxiFareFinder's embeddable calculator, you can offer taxi estimates directly on your website. Note: both the horizontal and vertical layouts will expand and contract horizontally to fill their container. Widths shown here are for example only. If you are a business recommending TaxiFareFinder to your visitors, we recommend creating a custom URL. By following the guideline below, you can create a custom URL where your customers/visitors will automatically have the destinations prepopulated on TaxiFarefinder. Follow the examples below. You can share a link to make your address appear in TaxiFarefinder. Share it with your customers and guests. They will immediately be taken to TFF with your address inserted on the page. Using the API, you can take advantage of TaxiFareFinder's proprietary algorithm and offer your users with our taxi estimates. Our API gives developers ways of embedding TaxiFareFinder's functionality into webpages and applications. For more information, go to TaxiFareFinder API page. If you are a taxi company, you probably have referred many of your customers to TaxiFareFinder.com. If so, thank you. If you currently link to us, you may want to try this custom Taxi Fare Calculator. 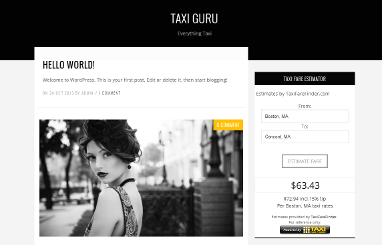 On this page, users will see your company logo and one taxi dispatch # listed...yours! This offer is limited to companies operating under a city or region that TaxiFareFinder already supports. You will not be able to specify your own rates or POIs. (However, you can always request them!) Contact us now to get started. 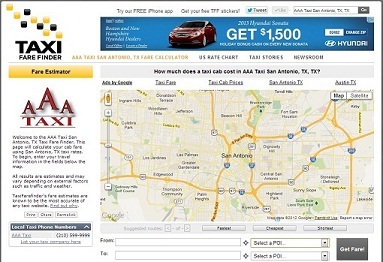 Try an example here with AAA Taxi from San Antonio, TX. If you have a WordPress website, this is a must-have plugin. You can now offer the popular taxi fare calculator directly on your website. Please refer to the documentation at TaxiFareFinder Plugin page. 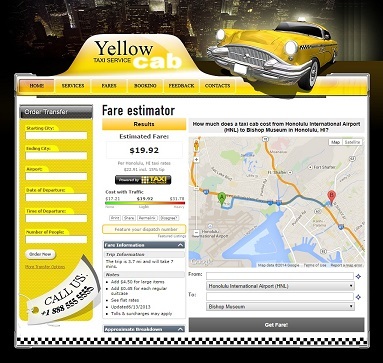 Allows your users to estimate taxi fares by providing "To" and "From" addresses.